"This recipe keeps halibut moist beyond belief! The sauce is delightfully rich, but not overpowering, with just a slight kick to it." Preheat oven to 425 degrees F (220 degrees C). Lightly grease a medium baking dish. In a bowl, mix the Cheddar cheese, mayonnaise, sour cream, flour, lemon juice, onion, and cayenne pepper. 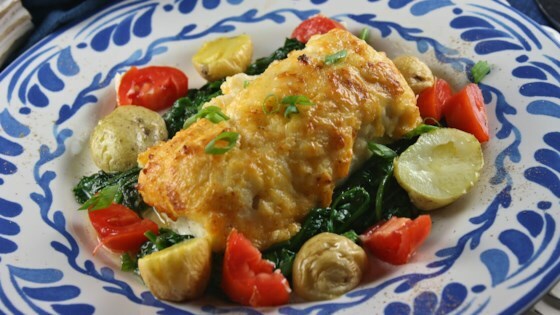 Arrange the halibut steaks in the prepared baking dish, and cover with the Cheddar cheese mixture. Bake 10 minutes in the preheated oven. Reduce heat to 350 degrees F (175 degrees C), and continue baking 15 minutes, or until fish is easily flaked with a fork. Turn heads (and plates) with this surprisingly easy, but very impressive, dinner. I made this with chicken and it was great! Our family LOVES this recipe!! I use Parmesan Cheese and mix it in the mixture and then sprinkle some extra on top. YUM!! I thought this recipe was FABULOUS. Craving it now. I used some dill when doing this and it turned out great! !